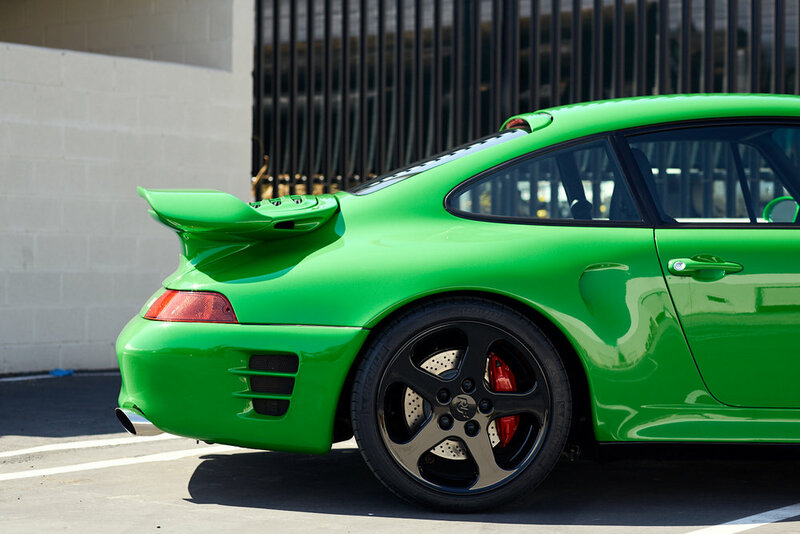 Based on the 993 Turbo, the RUF Turbo R has a twin-turbo engine that produces 490hp and 479lbft of torque. When combined with the turbo wide-body, actively controlled all-wheel drive and one of the world’s finest brake systems, and additional RUF components to achieve ultimate automotive performance. The Turbo R suspension was tuned with firmer springs, altered shock absorber damping curves, and larger anti-roll bars. Suspension modifications were complimented by 18 inch RUF five-spoke alloy wheels. Aerodynamics were optimized with RUF aero outside mirrors, and removal of the rain gutters. The BTR lightweight interior could be supplied as well as the RUF instruments and their green marking, RUF sports steering wheel with airbag, and specially-contoured sport seats. The IRC (Integrated Roll Cage) was a popular option. Acceleration to 62mph took only 3.6 seconds, and to 124mph took 11.8 seconds. With a suitably high sixth gear, top speed was 204mph.